One of my biggest temptations is to evaluate my life. From big questions to small questions, the drumbeat of my head is asking the same overarching question, “Is everything okay?”, “Am I okay?”, “Is my family okay?”. Was today a good or bad day? Am I a good mom, good coworker, good wife, good Christian? Am I measuring up to God’s will for my life? Why am I emotional all the time? Did I have a productive day? Did I let my emotions rule the day? Are people in my life happy with me? Am I growing, or just repeating the same sins over and over? Is my child growing in a Godly way? What have I done for God lately? Do I have the right balance for my life and family? Am I pulling enough weight in the family? These are enough to drive anyone crazy, and yet I allow them to persist or even run rampant in my life. I talk to other people about them. I allow this process of evaluation to dictate my mood, my relationships, and even my actions. My past performance continually robs the present moment. Is this really a sin? Shouldn’t Christians want to evaluate themselves so that they become more like Christ? The answer is in the Gospel, the good news. 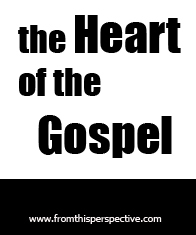 The Gospel affirms us as children of God. This “status” of ours is not deserved or earned. It assumes that all of us have blown it – but God rescued us anyway. I saw myself so stupid and so ignorant; I must seem like an animal to you, O God. But even so, you love me! You are holding my right hand! You will keep on guiding me all my life with your wisdom and counsel; and afterwards receive me into the glories of heaven! As we can learn from the Psalm, our shortcomings should point us and others to God’s ultimate strength as our rescuer. If we evaluate ourselves in any way, it should be done in light of what God has done for us and what he is currently doing in the weaknesses we identify in ourselves. If we stay too long in the period of self evaluation, without using this process to affirm ourselves as loved children of God – we will miss the gospel application in our life completely and fall into despair and hopelessness. May today be a day that we stop looking in the past, and look forward with the simple and yet amazing affirmation that we are loved.